BISC’s two synchronised teams have been offered the chance to skate in a prestigious international. The offer was made by NISA following the teams’ performances in the British Synchronised Skating Championships at iceSheffield on January 23. Bracknell has been one of the country's top synchro clubs since the mid-1990s although its fortunes have waned in the past few years after success both nationally an internationally – the former Ice Metrics team having twice represented Great Britain in the Junior World Challenge Cup. When many of the original skaters became too old for the two teams, first one team, then the other, failed to compete while the club rebuilt the synchro section almost from scratch. Now the club is delighted that it once again has two teams competing at championship level especially as most of the teams which existed five years ago have disappeared. Even Lee Valley – for many years the strongest synchronised skating club in Britain – didn’t enter any teams in this year’s championships. Last year Fusion won gold in the mixed-age competition held at the championships to encourage teams to take part which didn’t have enough skaters of the right calibre to field novice, junior or senior championship teams. 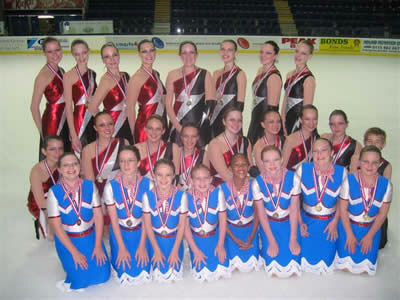 Ice Precise, which won gold in 1998 and 1999, finished fourth of the four teams in the novice championship. Fusion beat Nottingham in the first of the two qualifiers for this year’s junior championship – for skaters aged 12- 19 - only to be beaten by Nottingham in the second competition, after being advised by judges to make a number of changes to its programmes. The short technical programme was skated to Andrew Lloyd Webber’s Variations and the long free to a Queen compilation. Ice Precise, skating to a Hoe Down medley, came third in both novice qualifiers for skaters aged up to 14. And those results were repeated in the championships although the marks in both events were very close. Nottingham beat Fusion in the junior event and Basingstoke beat Nottingham and Ice Precise in the novice section. “There was only 0.1-0.2 in the marking and one of the judges had Fusion equal with the Nottingham team which had 20 skaters compared to our 16,” Sacha added. Fusion had hoped to have 18 skaters but had to cut back at the last minute because of injury and illness while Ice Precise had been without one of its strongest skaters for several weeks because of injury and lost another to injury just before the event. Being offered the opportunity to compete in the ISU competition at Nottingham in March helps to make up for Bracknell losing out to Nottingham which was selected after the second qualifier for the ISU competition in Italy in February. “We are absolutely thrilled that both our teams have been invited to do the Nottingham international,” Sacha said. Skating for Fusion were: Kasia Bielska, Alix Carter, Kirsty Clarkson (short programme), Gemma Cross, Sian Grimsey, Laura Hartley, Lucy Heap, Rachel Heap (long programme), Becky Highcock, Laura Highcock, Sara Holroyd, Charlotte King, Alison Ryder, Jo Simms, Alex Smith, Kirsten Smith and Lyndsey Steere with Amy Barnes, Susie Race and Steph Francis as alternates. Skating for Ice Precise were: Amy Barnes, Charlotte Briddon, Charlotte Brooke, Paul Dredge, Steph Francis, Laura Hartley, Rachel Heap, Becky Highcock, Laura Highcock, Helen Ingram, Charlotte King, Katherine Loades-Bannon, Susie Race, Alison Ryder, Alex Smith and Olivia Wessendorf with Rebecca Loades-Bannon and Danni McBride as alternates.